Bond Price Movements Bond X is a premium bond making annual payments. The bond pays a 9 percent coupon, has a YTM of 7 percent, and has 13 years to maturity. Bond Y is a discount bond making annual payments. This bond pays a 7 percent coupon, has a YTM of 9 percent, and also has 13 years to maturity. If interest rates remain unchanged, what do you expect the price of these bonds to be one year from now? In three years? In eight years? In 12 years? In 13 years? What's going on here? Illustrate your answers by graphing bond prices versus time to maturity. 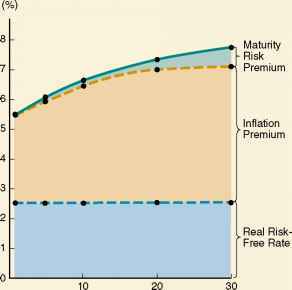 Interest Rate Risk Both Bond Bob and Bond Tom have 8 percent coupons, make semiannual payments, and are priced at par value. Bond Bob has 2 years to maturity, whereas Bond Tom has 15 years to maturity. If interest rates suddenly rise by 2 percent, what is the percentage change in the price of Bond Bob? Of Bond Tom? If rates were to suddenly fall by 2 percent instead, what would the percentage change in the price of Bond Bob be then? Of Bond Tom? Illustrate your answers by graphing bond prices versus YTM. What does this problem tell you about the interest rate risk of longer-term bonds? Interest Rate Risk Bond J is a 5 percent coupon bond. Bond K is an 11 percent coupon bond. Both bonds have 8 years to maturity, make semiannual payments, and have a YTM of 8 percent. If interest rates suddenly rise by 2 percent, what is the percentage price change of these bonds? What if rates suddenly fall by 2 percent instead? What does this problem tell you about the interest rate risk of lower-coupon bonds? Bond Yields Lifehouse Software has 10 percent coupon bonds on the market with 7 years to maturity. The bonds make semiannual payments and currently sell for 104 percent of par. What is the current yield on Lifehouse's bonds? The YTM? The effective annual yield? Bond Yields BDJ Co. wants to issue new 10-year bonds for some much-needed expansion projects. The company currently has 8 percent coupon bonds on the market that sell for $1,095, make semiannual payments, and mature in 10 years. What coupon rate should the company set on its new bonds if it wants them to sell at par? Finding the Bond Maturity Massey Co. has 12 percent coupon bonds making annual payments with a YTM of 9 percent. The current yield on these bonds is 9.80 percent. How many years do these bonds have left until they mature? Using Bond Quotes Suppose the following bond quote for IOU Corporation appears on the financial page of today's newspaper. If this bond has a face value of $1,000, what closing price appeared in yesterday's newspaper?